90 years ago today Rita Rizzo was born in Canton, Ohio. What she has done with her life in those 90 years is nothing short of amazing. Her life is a testament to the miracles God works when we love and trust Him with our whole heart and soul. Happy 90th Birthday, Reverend Mother! We love you and we thank God for your life! I was going to post a short video clip from Raymond Arroyo’s interview with two of our Hanceville sisters, but due to technical difficulties (it kept coming up in the preview as a clip from Star Trek Next Generation – very weird and I have no idea how that happened), I will just give you the link instead. Click here for a short clip or go to EWTN’s YouTube channel for the full video. Fr. Mitch’s live show was dedicated to Mother’s 90th birthday, you can watch it here. 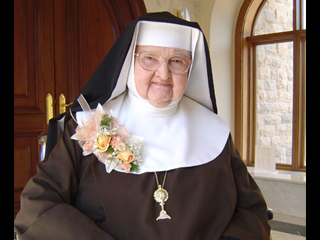 This entry was posted in A Nun's Life, Mother Angelica and tagged 90th Birthday, EWTN, interview, Mother Angelica by texasnuns. Bookmark the permalink. JMJ I was listening to Joan and Teresa on the radio this morning talking about Rome, and Teresa saying that every Catholic should visit Rome and the Holy Land at least once in their life. Teresa said she loved seeing the Saints and Martyrs and what they did. That’s how I feel about Mother Angelica and Deacon Bill all the Religious and Laity at EWTN. Like Our Lady is Queen of Saints and Mother Angelica is Queen of EWTN. In San Antonio, I first met all but Mother at the 25th Anniversary Family Celebration. And then on return visits with Fullness of Truth. Each time I felt as Teresa explained. I would just stand back and watch Saints in action. Deacon Bil, Fr. Mitch, Doug Keck, Doug Berry, Steve Ray, Marcus Grodi, Raymond Arroyo, Sr. Mary Catherine, Fr. Pablo Straub, Fr. Joseph Mary, Tim Staples, Rosalind Moss, and all the Saints at EWTN. And I would imagine the joy Teresa feels there in Rome and the Holy Land because that’s what I feel. The joy, hope, and the answered prayers longing for my beautiful Holy Church of my youth that I loved so much. And the added blessing of Sr. Grace Marie, Sr. Mary Peter (saw her profess her vows), Sr. Elizabeth Marie, and Sr. Rose Marie living right here in Texas at our Parish. So this must be what it feels like to be in Rome and the Holy Land. I don’t have a facebook page, so I’m glad to express my heartfelt gratitude for Mother on her 90th birthday. Thank you, Sisters, for this lovely post. I’ve been watching the special programming throughout this week on EWTN. The number of souls she’s helped to save have to be in the millions! We are all so blessed, and very grateful! May God continue to bless Mother Angelica, and all of you, Sisters, as well. With the joy and love of God that you convey through your posts, you too, are helping to change hearts and save souls!